Core-Max® Expedition TLSO with Rigid Posterior X-Panel. The Core-Max® Expedition is a lightweight and versatile pediatric TLSO incorporating all the benefits of a traditional SPIO® orthosis with a rigid posterior trunk support system. 1. The Core-Max® Expedition provides abundant and consistent sensory stimulation via compression. SPIO® orthoses provide two and a half times more compression than athletic compression wear. All SPIO® Orthoses are made of high-quality, specially milled fabric that is lightweight, wick-able and breathable. 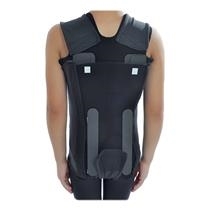 The unique SPIO® fabric maintains its compression, even after prolonged use, and features high-rebound properties and a strong neutral memory that assists the wearer in returning the body to mid-line. The Core-Max® Expedition can be utilized for a broad spectrum of children with varying levels of hypotonia. As a child demonstrates improved trunk control, the TLSO can be transformed by removing the panels, replacing them with stays, or worn without and ridged components. It is a progressive TLSO system that can be modified to meet each child's needs, even as those needs change.
" I just wanted to let you know that I have tried all of the new SPIO orthotics, and have been very pleased with the alternatives you are offering. I see improved postural alignment in each of my patients, when the new SPIO trunk supports are applied according to their individual needs. I do feel that when applied appropriately, the SPIO does provide the sensory input that many of my patients can benefit from, especially now that you offer so many varieties of trunk support. " " Compared with the hard TLSO, the soft one can provide support and also let the child using the muscle. I think that is the reason why our PT from Duke Children Hospital recommend this product to my son (SMA strong type 1). After using this product, I introduced this to other SMA children in China and bought 29 pieces for them. Brad, the general manager is very helpful and definitely wonderful person. We asked a lot of questions because those 29 children all has different requests, he can either answer them for us or find their PT to give us the right answer. So far, no return or exchange. And we will order more in the future! Thanks. " Thank you for another great SPIO product!
" The SPIO Expedition is absolutely perfect to control my 2 year old patient's excessive lumbar lordosis. He has upper extremity arthrogryposis, plus some other undiagnosed ataxia, possibly related to hyperplasia of right cerebellar hemisphere. He started hyperextending through the lower spine after developing sitting balance. This was used to facilitate his weak shoulder flexion. He is able to raise his arms without the extreme lumbar lordosis, but it has not possible to change his movement pattern even with a therapist trying to hold his lumbar spine in neutral alignment. I first tried the SPIO on him at PT on Tuesday and his therapist is thrilled. Thank you for another great SPIO product! "